"Everyone has three lives: a public life, a private life, and a secret life." The lives of Ms. Patricia O'Grady, New York City, NY, and Madame de Florian, Paris, France offer intriguing lessons of aging with their stories of living simply and, living richly. After their deaths, photos, stories, and questions filled the airwaves. 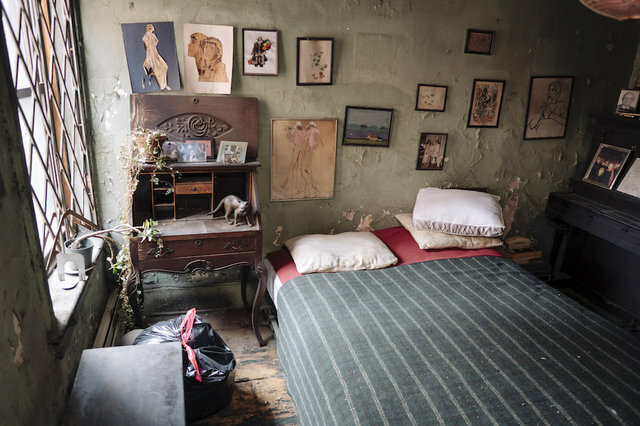 The world oohed and aahed over the intimate images reflecting a time capsule of decades rarely seen; the snapshots offered some small insights about these wise crones (ages 84 and 91) who lived and loved in their apartments. Why do these two women, their apartments, and stories cause intrigue? Perhaps it’s just basic nosiness. Perhaps you're growing older like them; I celebrate 65 turns-around-the-sun in October. Perhaps you see some of their character traits reflected in you. So, who were these two women? 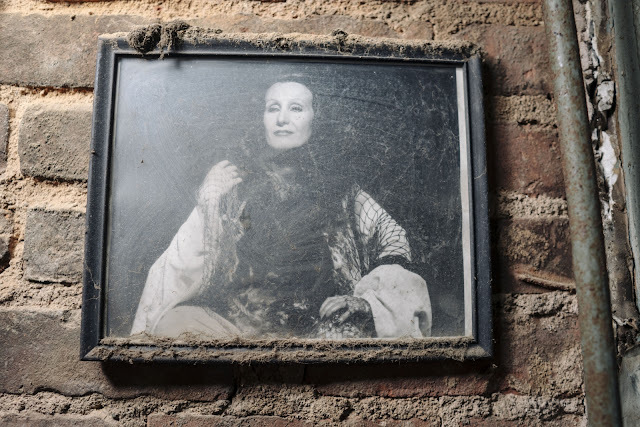 First, meet Patricia Clare O'Grady, an actress who lived simply, and richly. #1 Lesson in Aging: Follow your bliss. The daughter of a doctor, O'Grady grew up in a Californian household that included her parents, younger sister, grandmother and a maid. At 22 and just two weeks after graduating from UC Berkeley in 1955, she headed east by train and joined three new roommates in the Big Apple. Together these aspiring actresses rented the Greenwich Village apartment built in 1900 for $16 a month --$4.00 each--plus sweeping the hallways on all four floors. They each shared an ambitious appetite of making it big on stage and in showbiz! Several Broadway shows opened the year of their NYC arrival including the Diary of Anne Frank, Silk Stockings, Inherit the Wind and Damn Yankees. The roommates eventually moved out, but O'Grady remained for sixty years in the same apartment paying only $28.43 a month for rent. This two-bedroom apartment will now command $5,000 a month to rent. 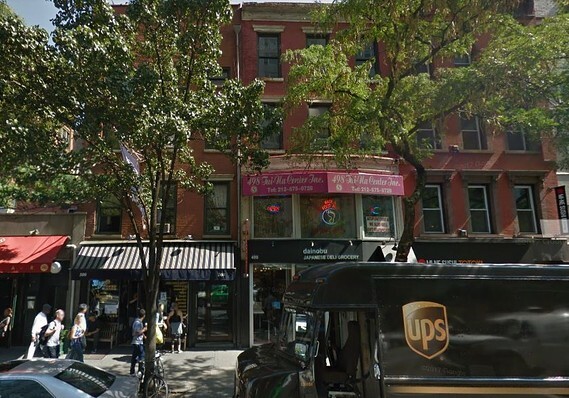 The fourth floor, cold-water flat apartment is above the blue and white striped awning of Murray's Bagels, the landlord's business. #2 Lesson in Aging: Regardless of anything or anyone, continue to follow your bliss! 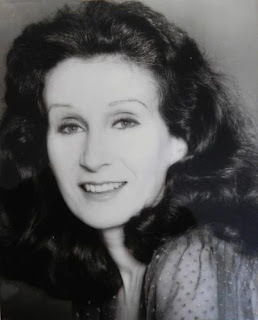 The extreme savings allowed O'Grady to pursue a passion for acting and dancing; this included taking twice-weekly lessons at the Joffrey Ballet School even as an octogenarian with osteoporosis. The savings also allowed her to live frugally, freely, and independently--something many desire to enjoy while aging and moving into and through the "Third Act" of life. "She took classes at the school for at least 30 years," shared Stephanie Godina, a teacher at Joffrey. A small memorial service at the school honored O'Grady when she died. Over the years, you can only imagine how many times friends or family told her to stop being "tough-minded" and move out and into a "better," more comfortable place. She remained true to herself. She followed her bliss to the last curtain call. #3 Lesson in Aging: Resilience and perseverance build character. Only a single gas lightbulb provided illumination, and when it went out, candlelight followed as her osteoporosis hampered making a replacement. The apartment’s two fireplaces provided some warmth. But really, can you imagine the frigid NYC temps on January 9, just two months before her death, with a reported high of 23° and low of 14° F?! It's noteworthy to restate that O'Grady lived on the fourth floor--the very top floor-- of this walk-up apartment. That means no elevators. No dumbwaiters. No doormen to assist with packages. Everything and everyone --food, purchases, wood, furniture, family, friends and she--made the trek upstairs. "I'm not worthy of these repairs and these improvements. I don't pay enough in rent to warrant this...I'm perfectly fine keeping it as it is." #4 Lesson in Aging: Find community and stay loyal. With no hot water, bathtub, or shower, O'Grady resourcefully used the nearby 14th Street YWCA every day to bathe—thus the name ‘cold-water flat’ which are rare, if not impossible, to find any longer in New York City. For a long time, she remained sinkless and stoveless until a sink and cast-iron stove recently entered the apartment. She also swam and could be found reading the NY Times most days at the YMCA. #5 Lesson in Aging: Remember, you control everything and nothing. The almost-85-year-old was crossing the street near her apartment at 498 Sixth Avenue when a car struck the actress on March 12; within hours, the injuries caused her to take a final curtain bow. How ironic that she didn’t even own a car! She controlled where she walked every day-- and she couldn't control what others did on her path. Curiously, she was born on September 12 in Oakland, CA. Then consider that the day after she died --March 13--was St. Patrick’s Day often thought of as a lucky day for the O'Grady's, one of Ireland's noble families. The family name means "illustrious." #6 Lesson in Aging: There are no secrets. 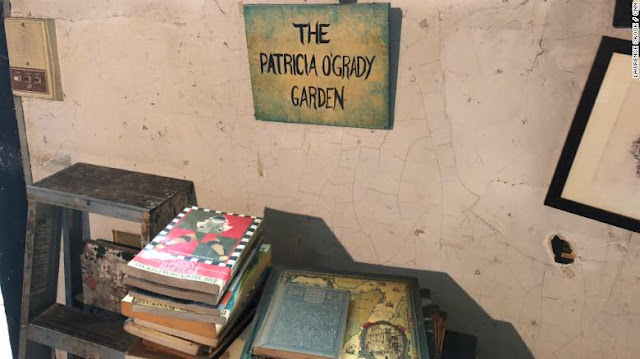 Death pulled back the stage curtain of her life; curiosity and publicity photos revealed “The Patricia O'Grady Garden” for the world to see what her friends called a ‘dump with character.’ Because of the publicity, many new "viral visitors" to the apartment might describe her home as anything but illustrious. For whatever reason, she allowed very few into her inner sanctum, including the landlords over six decades. According to Adam Pomerantz, the current landlord, she preferred to be left alone and asked for privacy in her walk-up apartment of two bedrooms on the top floor. 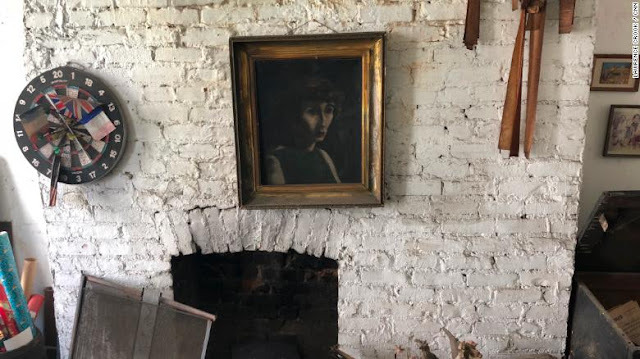 After O'Grady's death this spring, photos by strangers revealed peeling wall paint, and her simple possessions with a very worn, but oddly quirky and charming patina. 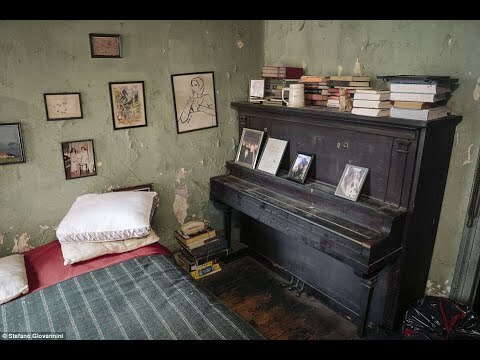 Paper piles and pictures filled many spaces with a piano in the bedroom. 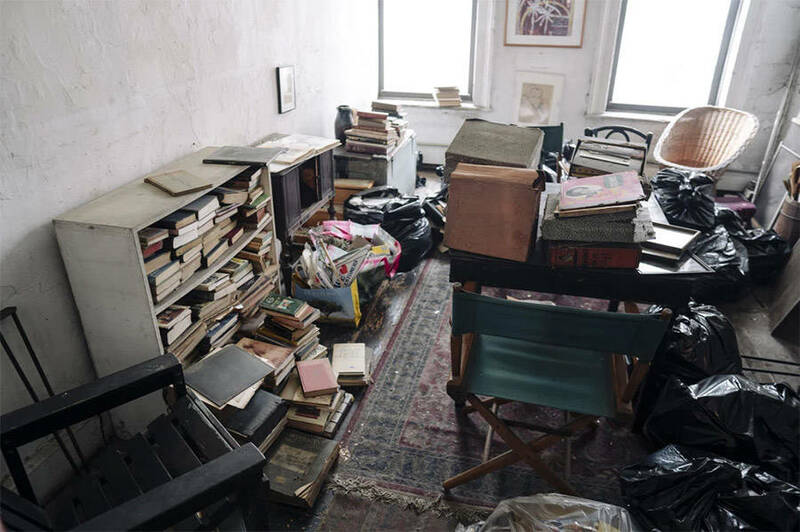 Stacks of books revealed numerous copies of Joyce Carol Oates's Solstice, "literary fiction that focuses on two unrelated women and their friendship/relationships with one another." You have to think that this very private woman would be calling for a "dead blackout," a stage term meaning no onstage lighting. She didn't want others to see her sanctuary! And here I am, shining the light on her home, but hopefully sharing her story in a respectful way that inspires others to live as she did: free. For a closing perspective, these Broadway and off-Broadway plays opened her final year including Mean Girls and Frozen; revivals like My Fair Lady and the Iceman Cometh and; new productions such as Returning to Reims and Fire in Dreamland. Now, there are no secrets. 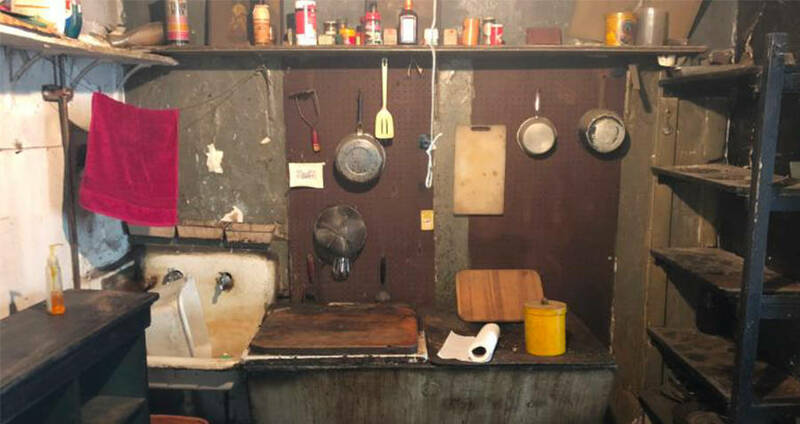 The world saw and commented on O'Grady's life and how she lived--especially about her $28.43 rent and what's being called the "Manhattan Miracle." If only the books, desk, piano, and paint peeling walls could talk! #7 Lesson in Aging: Life stories unfold while you live and after you die. * Wouldn't you, over a cuppa tea, like to interview O’Grady about aging while living simply and richly? * Wouldn't you like to know more details about her three lives: public, private and secret? * Wouldn't you want to hear about the Big Apple dreams planted during the 60 years of living in a cold-water flat? * Which dreams blossomed and which ones never saw daylight? * What advice would you share about how you lived to be 84? * What if anything did you enjoy about aging in the same apartment, neighborhood, and city? * Why didn't you feel worthy of the improvements made to your apartment? * What's your happiest and saddest memory of living here? * What's the most exciting or memorable thing you wrote at your desk? * How often did you play the piano? What was a favorite song? * How did you get the piano up four flights of stairs?! * Why didn't you ever move? * What play would you love to perform again? * Where do you get firewood in NYC for your fireplaces? 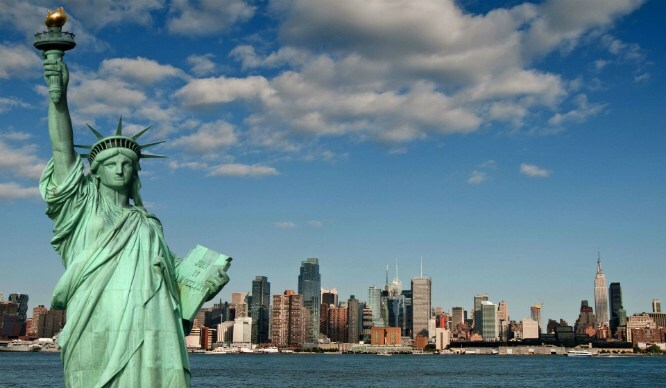 * What's your favorite New York City restaurant and why? * What's your favorite music for dancing and with whom? * What happened to the dreams of being married or having children--or did you ever have these dreams? What question(s) from this list would you ask? What might be another question? You might say her relationships also reflected a frugally unencumbered style of living. She never married or birthed any children. Her partner of 16 years, David Fulford, a director, and summer stock producer, predeceased her in 2009 of natural causes. And she did birth several roles with career accomplishments spanning 50 years and many off-Broadway productions. Now, only O'Grady can answer the question: Did your dreams come true? The landlord wants to gut and remodel the apartment. But who wishes that he wouldn’t? There is an intriguing, her-storical tale and space to preserve. Appreciating the honest comment from Pomerantz who said that the apartment looks worse now than when O'Grady lived there; workers have been bagging items and clearing the way for the renovation which might take six months. O'Grady's apartment is a rare, time-capsule testimonial to one woman’s desire to follow her dreams. Her story is one of independence, commitment, loyalty, resilience, perseverance, simplicity, living with less and frugally! Thank you Lore for this beautiful post. The lessons are worth noting. Resilience and perseverance are my favourite. Yes, she was a woman who was resilient and perservered for sure! Happy you resonated, Leila. Thank you for your kind words, Theresia. What an interesting story, and I love looking at the photos! She led a simple yet rich life. Thanks,Jill. Happy you saw the same things I did. I just wish I had met her, Suzie. A great lesson in simplicity and focusing on what's really important in life. I have lived in greenwich village for many years, in very small apartments, so I appreciate the neighborhood, the quaintness, the fire place, the exposed brick walls, the extreme use of space. But after a while the "location, location, location" wasn't working for me anymore and from my spacious house and heavenly garden I visit the village often, it always feels like home to me. Didn't know this about your life in NYC so THIS was fun to read, Rachel! 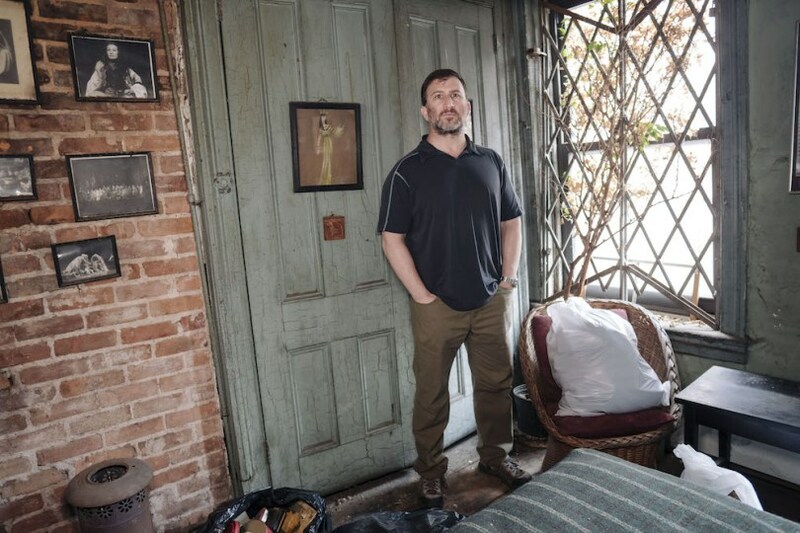 I giggled when you asked if friends needed someone to house sit or pet sit in Greenwich Village, lol! Someday I hope to visit the neighborhood, and YOU! Who knows, eh? I love learning about this inspiring woman who's life teaches so many amazing lessons. The photos were so fascinating and invoked many questions about her life. I love how creative she was and committed to living the life of her dreams! Thank you Lore for sharing her story. I look forward to learning about Mrs. De Florian next week! Thanks, Kelley. The photos were intriguing; I read about 10 articles and pulled photos from all of them. And I'm writing about Madame de Florian now! Stay tuned. What a fascinating woman. Thanks for sharing her story and the lessons you gleaned from it. Happy you enjoyed the post, Andrea. Fascinating and intriguing story Lore. Patricia Clare O'Grady lived life on her terms for sure. I have many questions I would like to ask her about the course of her life, if we could share a cup of tea! Yes, lots of questions for this intriging woman!